Leadership is a daily, ongoing practice, a journey toward becoming your best self and inviting others to do the same. And at the heart of this daily practice is courage. Through more than 120 interviews, I found a pattern of five key ingredients in how leaders have learned to cultivate courage. Three powerful main concepts are true self, trust, and community; the two key practices are paradox and reflection. Here’s a brief overview. Our basic premise is that inside of each person is the essential self who continues to grow and yet somehow, deep down, remains constant. Every person has access to this inner source of truth, named in various wisdom traditions as identity and integrity, inner teacher, heart, inner compass, spirit, or soul. Your true self is a source of guidance and strength that helps you find your way through life’s complexities and challenges. When you begin to listen to and trust the truest part of yourself, your choices and relationships flow from that trust, begetting more trust. Courage takes trust—in ourselves and in each other. Trustworthy relationships create the conditions for people to flourish and for positive change to arise. Relational trust is based on our perceptions of personal regard, professional respect, competence, and integrity in other people. Coming to understand the attitudes, assumptions, and biases that lead to such perceptions of trust entails honest inner work. Our collection of principles and practices is a time-tested approach for facilitating inner work and cultivating relational trust. Becoming more self-aware and trustworthy requires both individual introspection and a supportive community. We offer a specialized meaning of community as “solitude’s alone together” as well as a “community of inquiry.” Our practices offer models for how to reflect and interact with each other so that new clarity and courage can emerge. Being receptive to the very idea of needing other people in community takes courage and yet, in turn, creates resilience. Leaders must know how to invite people into and hold them accountable for co creating trustworthy space so that they can support each other in service of their work together. Achieving effective collaboration requires genuine trustworthy community. We can learn to practice paradox by recognizing that the polarities that come with being human (life and death, love and loss) are “both-ands” rather than “either-ors.” We can learn to let those tensions hold us in ways that stretch our hearts and minds open to new insights and possibilities. With paradox we honor both the voice of the individual and our collective intelligence. We trust both our intellects and the knowledge that comes through our bodies, intuitions, and emotions. Paradox values both speaking and listening. An appreciation of paradox enriches our lives, helping us hold greater complexity. Integrating our inner lives with our work in the world comes from daily practice in holding paradox. Refection cultivates more ways of knowing and learning that complement your mind and emotions, but draw from a deeper place: your intuition, imagination, and innermost being. Reflection is a practice that can be enriched by the mirroring of trust- worthy companions. When we reflect together, such as by exploring how universal stories of human experience intersect with the personal stories of our lives, it can create relational trust. Guided conversations focused on a poem, a teaching story, a piece of music, or a work of art—drawn from diverse cultures and wisdom traditions—invite us to reflect on the big questions of our lives, allowing each person to explore them in his or her own way. Reflection helps us find the inner ground on which we stand firm, and it helps us find common ground with others. Shelly L. Francis has been the marketing and communications director at the Center for Courage & Renewal since mid-2012. Before coming to the Center, Shelly directed trade marketing and publicity for multi-media publisher Sounds True, Inc. Her career has spanned international program management, web design, corporate communications, trade journals, and software manuals. The common thread throughout her career has been bringing to light best-kept secrets — technology, services, resources, ideas — while bringing people together to facilitate collective impact and good work. 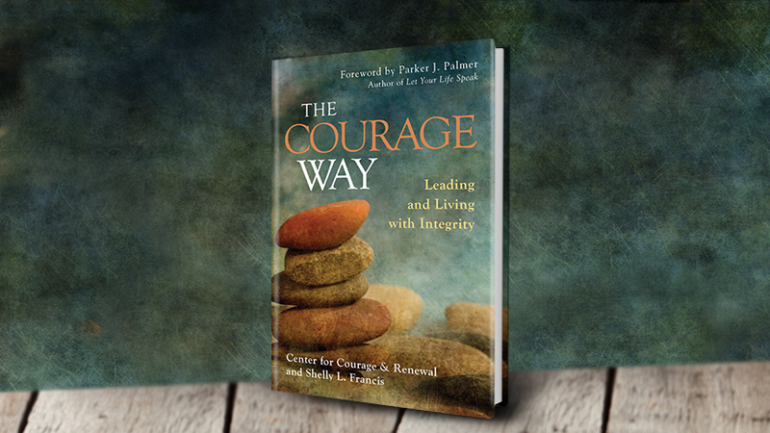 Her latest book The Courage Way: Leading and Living with Integrity identifies key ingredients needed to cultivate courage in personal and professional aspects of life.